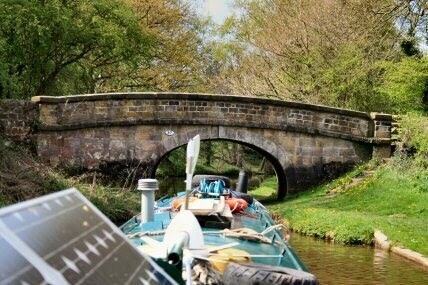 The first bridge of the day. 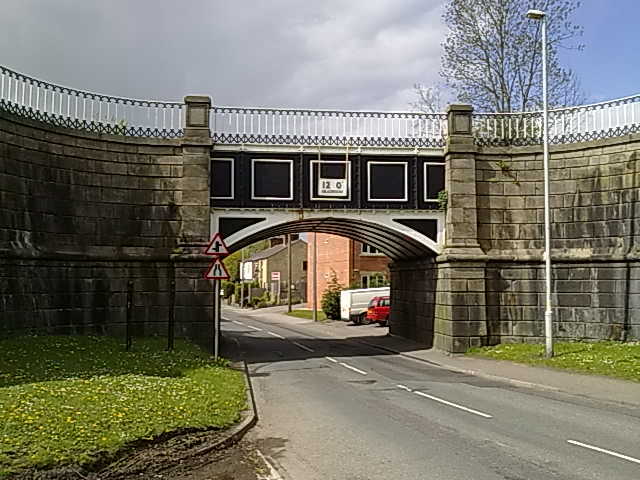 There are no swing or lift bridges or locks today. A nice easy run into town. 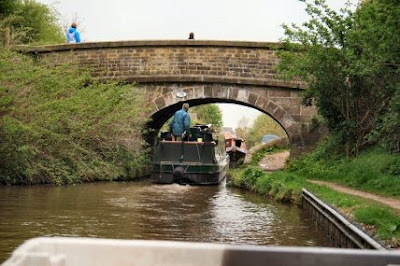 With the canal being so shallow and narrow the meeting of other boats can be a bit awkward but as long as the other helmsman takes it steady there is no problem. 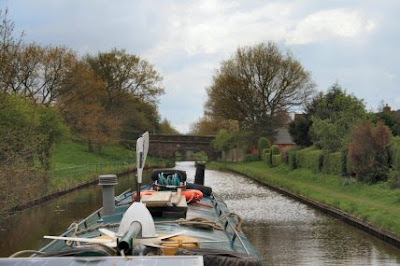 The other boat going past can help as it takes the waters the bows will be pulled over to the center of the canal as being able to turn while so close to the canal edge and almost aground would be difficult. 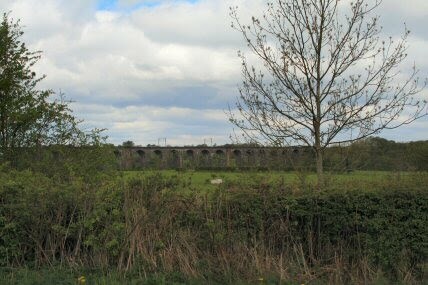 The West Coast Main line keeps popping into view as it crosses the valley. The canal is running almost parallel until the railway crosses over in Congleton. Approaching Congleton and a shock! the canal runs in a straight line for over a mile. 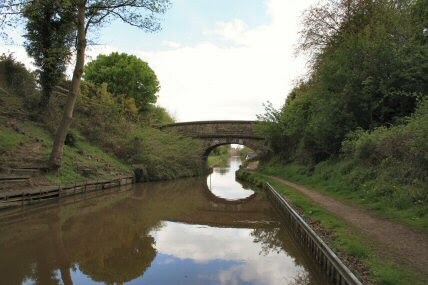 The longest view along the canal for a long time. Down in the valley I spotted an old farm. 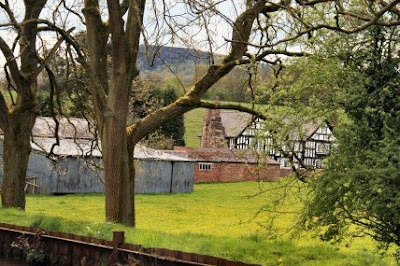 By the time I got the camera out the farmhouse was about to disappear behind the trees. Just look at the size of the chimney. A sign of an ancient building apart from the black and white work and overhanging upper storey. Every so often you will find a BW workboat tucked away waiting for the call. More work. They are re-piling the canal edge so the towpath here is closed at the moment. 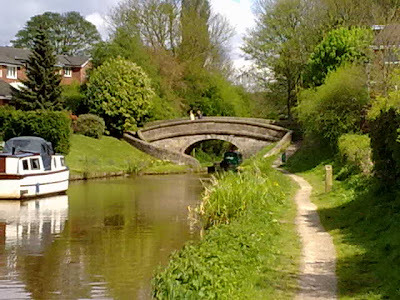 Given a year or so the Macclesfield canal will be transformed. 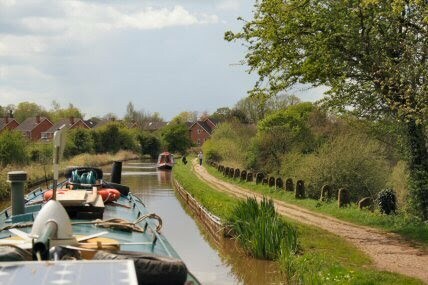 The outskirts of Congleton are approached via a trip through the woods when the canal all of a sudden pops out onto a high embankment. 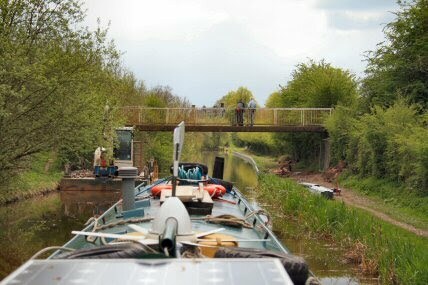 The last couple of bridges before the mooring are not very pretty and quite forbidding. There is a tiny kink in the narrows as you go through and the otherside is quiet and a good mooring. As I said earlier you have to take things easy. These two didn't. They both wanted the bridge and neither slowed down to let the other through - consequence - a collision. 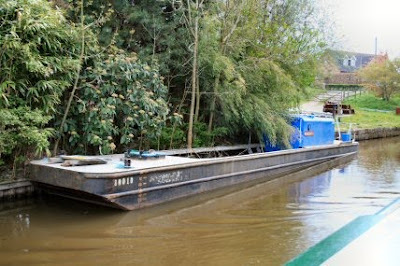 The second is a hire boat but the owner of the first one should not have forced his way through and should have known better. 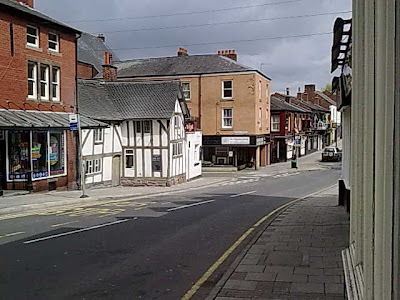 It is a ten day camel hike to get into Congleton. You can either walk down from Bridge 75, which I did, but then you have to walk down the expensive side of town. Looking at the map on the phone I saw Canal Street. 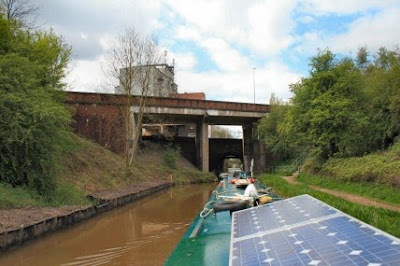 Stands to reason that it must run up to the canal so that was the way I returned. Much nicer with terraced houses and its straight up from the center of town. The entry back onto the canal is at the Dog Lane aqueduct. Looks smart doesn't it.